Disco adventure – HubNut – celebrating the average! Having got the Discovery working again after its clutch slave failure, I headed up to Bala, Snowdonia for a serious bout of off-roading. My destination was Landcraft, which uses a 6000 acre site (yes, 6000) to lead groups through some very interesting terrain. So far, I’d either tackled greenlanes or visited Pay and Play sites. I like greenlaning, but its fraught with issues and a nagging sense that people regard you as worse than someone who kicks puppies. It’s also given a very bad press because some people who do it are complete idiots, who charge around as if they’re on a rally and regard route maps as optional. Pay and Play sites can be even worse, as people treat it as a proper ‘no holds barred’ thrash-about. These places are not somewhere you can gently discover the limits of your vehicle. There’s also the fact that people turn up in massively modified stuff, with huge tyres and suspension lifts and things. If you’re in something stock, you’re going to struggle to the mess the modified stuff makes of the landscape. I doubt I’ll visit a Pay and Play site again. So, Landcraft seemed like a happy medium. Like a greenlane trip, but all on private land using lanes that had been hand crafted in places to offer a suitable challenge. It had the structure and control I missed at Pay and Play sites, but more freedom than when greenlaning – hooning through puddles is not a problem! Sadly, I didn’t get any photos that really capture how challenging some aspects of the day were. I felt both my skills and the abilities of the Discovery were given a thoroughly good work-out though. 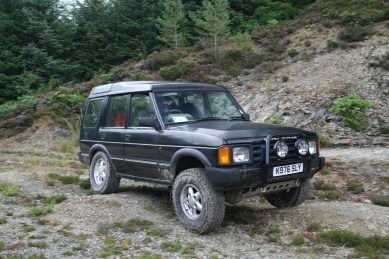 So, below is a picture of another Discovery 1 flexing those coil springs. It was several rocky scrambles up very steep hills that really got the adrenaline flowing. Battling for traction required deft throttle work – too much and you’ll wheelspin and get stuck, too little and you’ll just stall. That was becoming a serious issue for me as the starter motor packed up mid-way through the morning session. Just my luck! 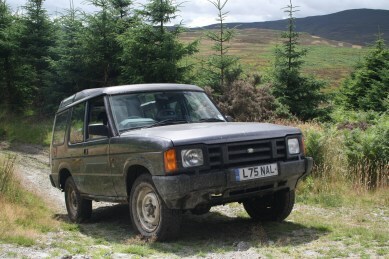 The older vehicles were in stark contrast to the more modern Land Rovers. On these, traction control did the deft footwork for the driver – truly astonishing to watch in action. Land Rovers would come to a wheelspinning halt, then the traction control would brake the spinning wheels, sending the drive to the wheels with grip, and they would be on their way again. Very impressive, but I do prefer having to do the work myself. Toys can take some of the fun out of a challenge. Despite the starting issue, the day was a great bonding session for me and my Disco. I covered 150 miles in total, mixing high-speed driving with low-speed rock crawling. I spent almost 10 hours at the wheel, with seven of those on the off-road site. It was an exhausting but utterly thrilling day and I can’t wait for another go! First though, I need to start tackling some of the Disco’s issues. There’s a nasty clonk from the front end somewhere, an annoying whine from the rear and that starter motor needs replacing. Also, the MOT is due soon and I’m meant to be heading for a laning trip in North Yorkshire next month. It’s a good job I like it.